This one is going to be huge. I lose my mind for anything that includes a training montage or teenagers discovering their special powers. It’s the reason I have seen The Craft, The Karate Kid, and the X-Men movies a ridiculous number of times. 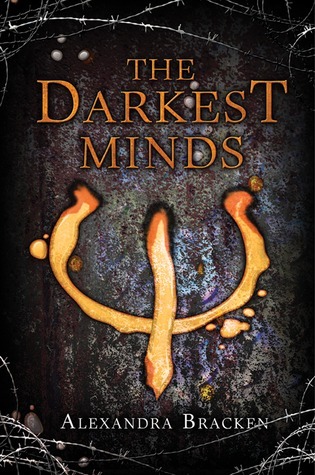 It’s also the reason I was in heaven reading The Darkest Minds. A virus has wiped out almost an entire generation of kids, but those who survived have exceptional abilities which frighten the adults around them. Herded into “rehabilitation camps”, they are labeled by color. Reds are able to create fire, Oranges can control minds, Yellows can manipulate electricity, Greens are brilliant, and Blues are telekinetic. Before you join me in spending hours debating which ability you’d prefer, know that life is not rosy for the kids. If they manage to escape the camps, like our heroine Ruby, they may spend the rest of their lives being hunted by a variety of different agencies, all for nefarious purposes. This is a premise I love, but even better are the characters. Ruby is well-developed and likable. She is haunted by so much–her powers, her past, and her fears for the future. Author Alexandra Bracken realistically describes the way she pushes through everything that scares her and becomes a brave protector of her friends. And what friends she has! It would be unfair to reduce them to Liam, the leader, Chubs, the brain, and Zu, the silent child. They are characters that the readers want to prevail, even when it seems like the entire world is against them. The Darkest Minds is the first in a series, but the novel ends in a way that it could be a standalone title, albeit a sad one. The film rights have already been purchased, and I will be the first in line for the movie or the sequel, whichever comes first.